A rare Saturday work assignment got in the way of my coaching duties this past weekend. 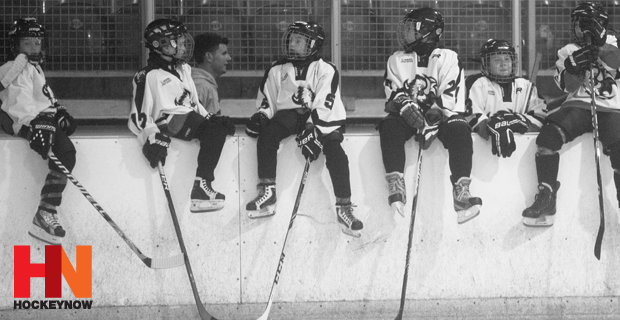 Of course I'd much rather have been behind the bench with the Minor Novice Wild and Atom Avalanche, the house league teams I help coach in Toronto. However, because I'm also rather fond of eating and having a roof over my head, duty called. The biggest thing you miss when you're not coaching? It's not the wins, although the odd 'w' is definitely nice. But the best part of coaching is developing a dialogue with the kids and getting a chance to see the world through their unique and innocent eyes. Owen, for instance, is an entertaining young man on our Avalanche squad. Opening day is always exciting and two weeks ago we were in the middle of our first game of the year against the Sharks. The kids were pumped and our Avalanche parents were also in a good mood. For one thing, we were winning our season debut and, more importantly, the game was being played at 7.00 p.m. on a Saturday night; a pleasant change from the usual early morning eye openers in minor hockey. Apparently, "prime time" also agreed with Owen, as in the middle of our eventual victory he turned to me on the bench. "Coach Mike," Owen stated, "Just to let you know, I won't be at any of our morning games because I don't like to wake up that early." Fair enough. . . although something tells me mom and dad, who forked out the cash for Owen's hockey equipment and registration fee, might have a little something to say about that. And with all respect to my buddy Owen, there are kids with, shall we say, a higher degree of "commitment". For instance, I had the pleasure of coaching a strapping young lad named Jimmy in a ball hockey league for six and seven-years-olds this past summer. Jimmy was one of our top d-men and in the middle of a tight game, I was busy on the bench passing out tips on how to preserve our one goal lead. Jimmy took in all of my hurried instructions, and then he cut right to the chase. "Don't worry, Coach Mike," he said, as he sprinted into action, "You shall not be let down!" And I wasn't as, God bless him, Jimmy buzzed around our back end making sure we pocketed the two points. Maddox was another amazing little guy on our summer ball hockey squad, as "Mad Dog" always had a way of helping the coaching staff keep everything in perspective. In another nail biter, with our goalie pulled and our guys desperately trying to tie it in the final minute, "Mad Dog" suddenly tugged on my arm as we watched the action from the bench. "Coach Mike," he asked, "What do you think I should be for Halloween this year?" "Can I get back to you on that, Mad Dog?," I replied, "I kind of what to see how this game turns out." In the end we didn't get the equalizer, losing by one goal. But the most important thing is my memory of Maddox and the funny little lines he delivered all season. And, oh yeah, one other important detail I never did clear up. I wonder what "Mad Dog" IS going to be for Halloween this year?